Warm Sticky Toffee Mug Cakes that can be baked for a great dessert or snack for the family or entertaining, or make a single serving quickly and easily in the microwave! Disclosure: This post is sponsored by CorningWare Meal Mug™. As always, all opinions are my own. Thanks for supporting brands that support Seasons and Suppers. When I was given the opportunity to try the Corningware Meal Mug™ recently, I just knew I wanted to make a mug cake. Mug cakes are popular in this house. 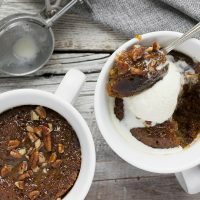 There is nothing like curling up with a warm mug of sweet, goodness :) I have also always wanted to make a mug version of one of my favourites – Sticky Toffee Pudding. The Meal Mugs™ makes baking (or cooking) as easy as 1, 2, 3. It’s the only tool you’ll need to make everything from coffee and cocoa to soup, chili, oatmeal and of course, Sticky Toffee Pudding Mug Cakes! Made of a durable stoneware material, the CorningWare Meal Mug™ is dishwasher, refrigerator, freezer, microwave and pre-heated oven safe. The Meal Mug™ is dishwasher, refrigerator, freezer, microwave & pre-heated oven safe. It also has a non-porous surface that doesn’t absorb food, doors, flavours or stains. The patented vented lids are BPA free, microwave and top-rack dishwasher safe. 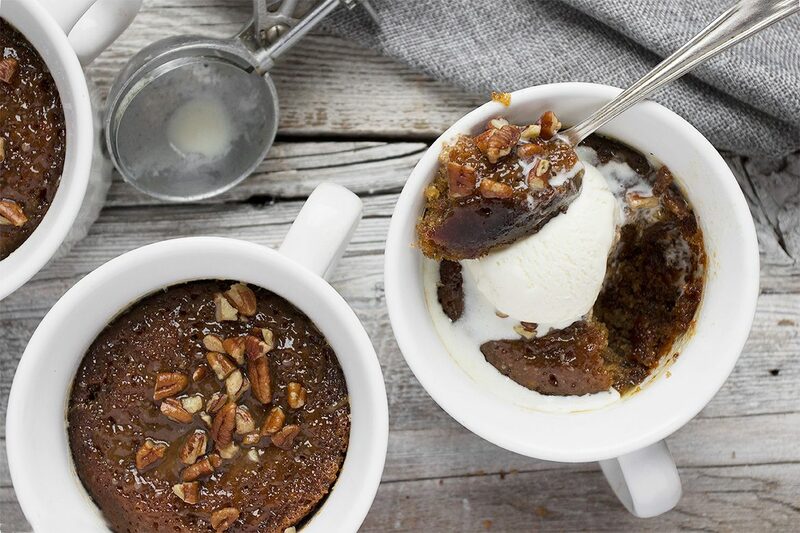 The amazing ability of the Meal Mug™ to travel from freezer or fridge to oven or microwave provided a great opportunity to do both a baked and microwaved version of a Sticky Toffee Pudding Mug Cake. That said, sometimes, you only want one mug cake and you want it fast. I get that! So I’ve also included (just below here) a quick and easy single serving Sticky Toffee Pudding Cake, that’s pretty darn satisfying for a mug cake that’s ready for eating in about 15 minutes. *NOTE: Microwaves vary, so timing may be a bit different in your microwave. Use your best judgement to adjust time by looking at it/testing. Measure out dates, then coarsely chop. In a medium microwaveable bowl, add 1/4 cup water and microwave on high for 50 seconds. Stir in the chopped dates and baking soda. Stir to combine, then let stand for 5 minutes. After 5 minutes, add the butter to the bowl with the dates and let it sit in the warm liquid for another 5 minutes. Make the sauce by combining the butter, brown sugars and cream in a medium microwavable bowl. Microwave on HIGH for 30 seconds. Remove and stir for 15-20 seconds or until butter is melted. Return to the microwave and microwave a further 30-45 seconds or until the sauce coats the back of a spoon. Set aside for now. After the dates have stood for the second 5 minutes, stir to combine (butter should be all melted). Add the brown sugars and stir in to combine. Add the flour, baking powder and a pinch of salt. Stir until flour is all mixed in. Spoon batter in to Mug. Microwave on HIGH for 2 minutes uncovered. Test with a skewer to make sure the cake is set. Use a skewer to poke some holes in the cakes and run it around the outside as well, to make some space for the sauce to fill down the sides. Pour toffee sauce over-top. Garnish with some pecan pieces, if desired. ALLOW TO STAND A FEW MINUTES before eating, to allow the sauce to cool a bit and the cake to set-up and the sauce to soak in. **Important that you let it stand. That sauce can be very hot!! Enjoy warm plain or with a scoop of ice cream. 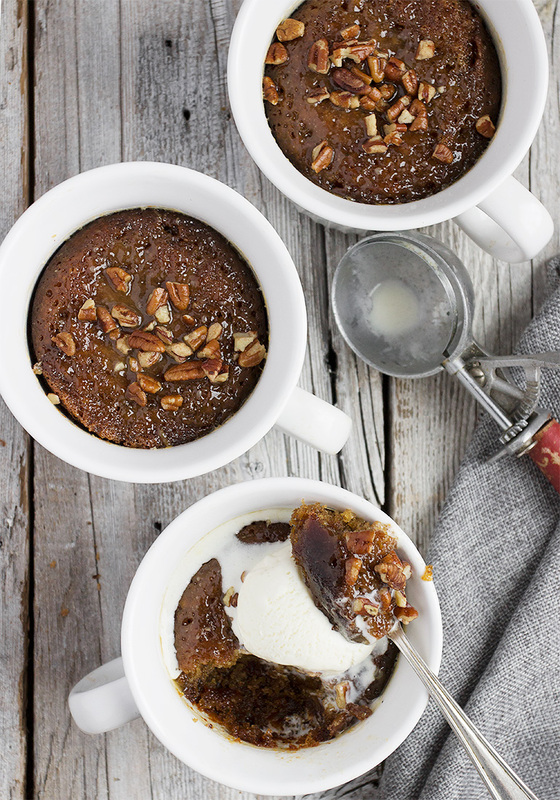 Delicious, baked, warm individual sticky toffee pudding mug cakes. Perfect for dessert of snacking. You can also bake these in ramekins or as one large sticky toffee pudding in an 8-inch baking dish. 2/3 cup heavy whipping cream 35% b.f.
Make the sauce: Combine butter, brown sugars, cream and salt in a medium saucepan on the stove-top over medium heat. Stir until butter melts and mixture comes to a boil. Boil for 4 minutes, or until the sauce coats the back of a spoon. Remove from heat. Add 3 Tbsp. sauce to each of 4 Meal Mugs. Place mugs in the freezer while you make the rest of the cakes. Set aside rest of sauce. Make the cakes: Measure out 1 cup of dates, well packed, then remove to a cutting board and coarsely chop. Add to a medium bowl with the baking soda and boiling water. Set aside to stand while you make the cake batter. In a medium bowl with an electric mixer or the bowl of a stand mixer with a beater blade, beat the butter with the brown sugars until creamy. Add eggs and beat until combined, scraping down sides of bowl as necessary. Add flour and baking powder, along with a pinch of salt. and mix until smooth. Add soaked dates together with the soaking water. Mix until combined. (Batter will be quite liquidy at this point). Remove Mugs from freezer. Divide cake batter between 4 Meal Mugs and place on a baking sheet. Bake in preheated oven for about 35 minutes, or until a tester comes out clean. Remove from oven. 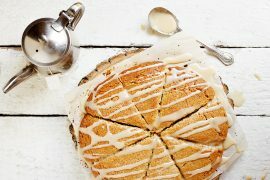 Use a skewer to poke holes in the cakes, then pour the remaining sauce over-top, dividing it equally between the 4 mugs. Change oven setting to broil, with rack positioned so the tops of the mugs will be about 6 inches from the heat source. Return tray with mugs to oven under broiler and broil until sauce is bubbly. WATCH CLOSELY as this can easily burn. It will only take a short time, so don't take your eyes off them. Remove from oven, garnish with some pecan pieces, if desired and let stand a few minutes, to allow the sauce to cool a bit. Enjoy warm with a scoop of ice cream, if desired. I’m about to make the baked version of these & noticed that your recipes says ‘serves 8’ yet the instructions tell me to divide the mixture into 4 mugs. Could you please let me know if this serves 4 or 8? Hi Louise, it totally depends on the size of your mug. The large corningware mugs I used here only make 4. But they are big! Smaller mugs will go much further or ramekins will make 8. These look so cozy and comforting, the perfect winter dessert! 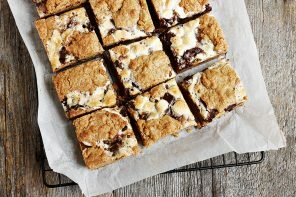 Oh my goodness, these look amazing, Jennifer!! My husband has a strange addiction to mug cakes… like, he is always begging me to make them. Lol. I never complain because they are so dang easy! Can’t wait to surprise him with this one, and I will take your advice and bake it!! I hope you and your family have a wonderful holiday! Cheers! Thanks Cheyanne and I get your husband’s addiction. There’s just something about wrapping your hands around your own personal warm mug of cake ;) He will love this and yes, the baked version is so perfect. Worth the bit of extra time to make. 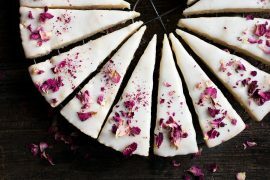 It’s just the Mr and I living in our little house so I’m loving the idea of making teeny tiny cakes for two. Of course you didn’t bring us just any old cake but rather this ooey, gooey super tantalizing sticky toffee pudding cake. How could I possibly resist? Hi Lynn and you must not even try to resist :) These are yummy little cakes and do enjoy! What a fun idea to make these cakes in mugs, I totally need to pick up a set and give this amazing looking treat a try! Thanks Sara. I think you would love these! Oh my goodness. I will want one of these when we come home from skiing and sledding over the holidays. You make the most delicious treats, Jennifer! I just love the cozy feel of this yummy pudding and want to be curled up under a blanket with a spoon. It sure is hibernating weather! Merry Christmas to you and your family, Jennifer! Thanks Robyn and yes, the perfect thing to warm up with :) Sounds like the weather will be giving us a break for the next while, so that’s a nice change! Merry Christmas to you and yours as well. Ok Jennifer..you’re killing me this week! I had sticky toffee pudding only once in my life at a restaurant in Toronto years ago and it was so good! I am going to be making this for Christmas! Thanks so much for posting this! I have several of these mugs and we love them – but I would love them even more if they had this pudding inside! Wow – just wow – this is a dreamy dessert for sure. I’ve always wanted to make mug cakes but never have – guess I need to try this one! Perfect holiday dessert. Merry Christmas Jennifer! Thanks so much, Tricia and Merry Christmas to you, as well!! Another delicious mug cake Jennifer! 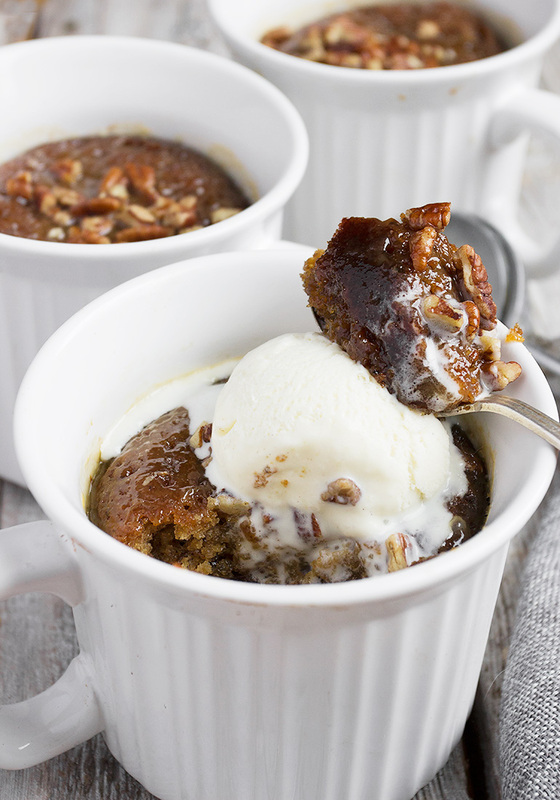 I have actually never tried sticky toffee pudding, but holy moly it looks good! Oh my goodness!! These have my name written all over them. 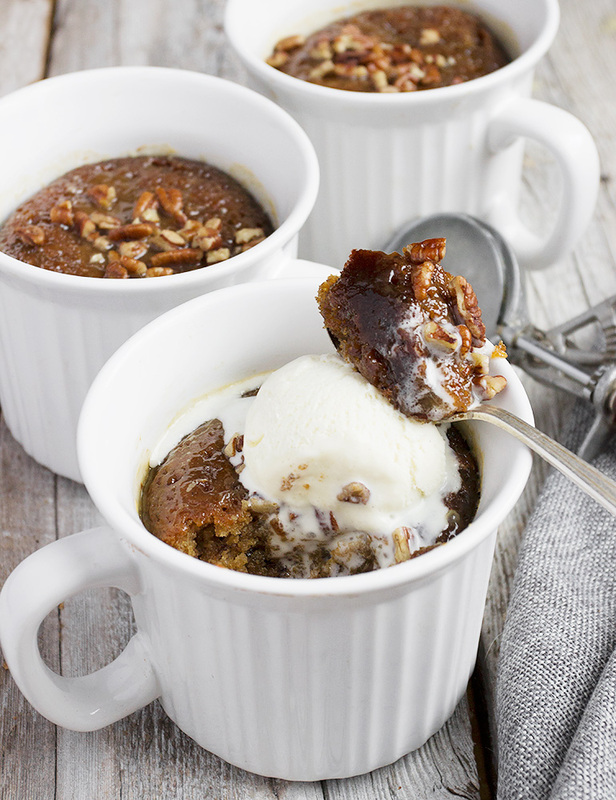 Sticky Toffee Pudding is one of my all-time favorite desserts. I love this mug version, I will be trying it, for sure! Thanks Chris :) These were so good. I hadn’t had a sticky toffee pudding in ages and it really hit the spot! !